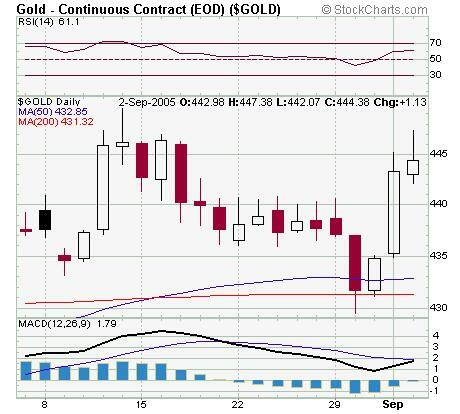 The Eurosystem has again been absent from the physical gold market in the week ending September 2, the latest weekly statement from the European Central Bank (ECB) shows. It is the second week in a row that the Eurosystem members have abstained from gold sales. Gold bugs' claims that the gold sales under the Central Banks Gold Sales Agreement are suppressing the price of the yellow metal are getting a foundation from recent price developments. In the absence of central bank sales gold has risen solidly above the crucial $440-mark, helped by the new weakness of the US currency. According to the Gold Sales Agreement central banks will continue their sales of 500 tons p.a. after September 26. Strong physical demand from the Indian subcontinent and the Middle East has lent gold a solid support at $415 per ounce this year.